Making the case for purchasing ready-made, inclusive emergency survival kits is rather easy. Whether you are just beginning to prepare for your family’s safety in case of an emergency, or you are a veteran prepper, the task can be overwhelming. Will you be able to stay where you are? How about a vehicle if you have to leave? Have you prepared enough emergency food, water, fire and shelter for everyone? How about clothes, camping items, and storage containers? These questions just begin to touch upon all of the issues you need to take into account if you and your family are going to survive some type of devastating disaster. Fortunately, much of the survival equation can be taken care of quickly and simply by pulling out your plastic. 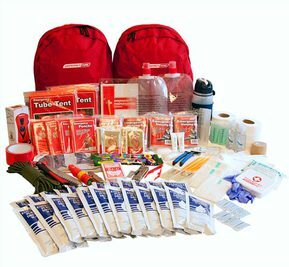 The Internet provides instant access to emergency survival kits and packages which can be purchased from the comfort and privacy of your home. And your options are limitless. There are survival kits for pets and people, and you can spend as little as $25 or over $1,000 per package. There are products available which deliver 72 hours of minimal survival needs, or 1 week’s worth of disaster preparedness products which allow you to live in relative luxury. All of the emergency food companies that we’ve provided reviews for on our pages for short term food supply and long term food supply all offer a nice variety of survival kits and bug out bags that are already comprised of emergency food, water and survival gear. They also provide individual products if you are interested in creating your own DIY bug out bag. We also have a page that covers survival kits for pets. In the late 1990s the world began to worry about the effects of the new millennium on computers and electronics. There were also those individuals that had religious beliefs which impressed upon them the need to be prepared for a global catastrophe of biblical proportions in the year 2000. Around that time, several companies began to offer disaster survival and emergency preparedness products online. That is both a good and a bad thing. The good news is, there are more than enough options that cater to your unique situation. The bad news is, you may not know who to trust. Fortunately, online prepper and survival forums allow you to communicate with others who have purchased these products online. And there are survival review sites that rate the pros and cons of popular emergency supply and survival kits. This means that in many cases you can get the opinions of someone just like yourself, and benefit from that person’s purchase, use and beliefs of a certain product. This makes purchasing pet survival kits, first aid kits, home, vehicle and office survival kits of all types a much less daunting task. There are companies which have been making ready-made survival packages and kits for many years. Once again, by checking with individuals in survival forums, as well as online reviews, you can quickly locate which companies have the best reputations for providing excellent products and customer service. We are in the process of rating specific survival kit suppliers. Two that we have already approved include BuyEmergencyFoods Survival Kits and Wise Food Storage Survival Kits. We will be posting reviews for these and other high quality survival kits soon. Purchasing a ready-to-go bug out bag or survival kit is certainly not your only option. You can do the research, the shopping and take the time to build your own. But if you want the easiest and fastest way to prepare yourself and your family for a possible disaster or emergency situation, shopping for and purchasing survival kits online gives you a wide variety of options and the fastest emergency preparedness solution.